So I have another blog out there that’s not too hard to find, but as it is irrelevant to what I am embarking upon now, I figure I won’t link to it now. I am a week past taking my pediatric board exams, and I am approximately 13 weeks away from being a mother for the first time. It is a strange thing, guiding people in parenting and childcare when I don’t have children of my own. Parenting certainly doesn’t require an M.D. degree, and I don’t think that an M.D. qualifies me to be a great parent! But I am hoping that it helps me along the way. Through this blog I simply plan to talk about the transition to motherhood. I’ll be ranting about purchases and decision-making. I’ll hopefully be posting pictures about what I am looking at, I’ll be making decisions about how to set up the nursery. So far I don’t expect too much stuff medically related, though I am currently in the middle of a sore throat and am suppressing my desire to take pain medications. Remember – NSAIDS, AKA your typical Motrin/Advil/Alleve are definitely NOT good for baby during the second and third trimesters of pregnancy. Today my husband and I actually leapt forward and did something I’ve been stressing over for months. We bought a crib! We purchased everything at Baby Supermart – a highly rated baby store in our area where we got some pretty good deals and had a great selection, with very helpful, patient staff. Maybe the crib is not the one I wanted most, but definitely a nice one and a simple one that we both agreed would be attractive for baby. I initially didn’t intend to buy Pali – I was thinking more of Baby’s Dream or the Land of Nod “Straight Up” Crib, but when it comes down to it one must be practical. The Pali Imperia was definitely that. We live in a small apartment and can’t realistically get a behemoth crib that has a large headboard and didn’t have a sleigh crib in mind. So we opted for a “low profile” crib that I am afraid that my little infant will quickly learn to climb out of, but at least my little 5′ 4″ frame is able to bend and lift a child with this crib. And the price was right, as opposed to our beloved Land of Nod crib which would have cost more than double what we paid for the Pali. 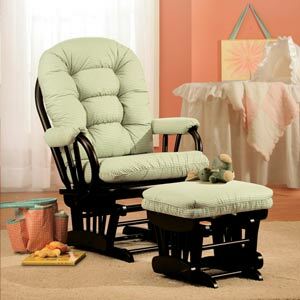 We also finally chose a glider with an ottoman by Best Chairs. It was a tough call between Dutailier and Best Chair Storytime series, but again price won out. Also, the reviews on Windsorpeak.com (makers of the indispensable Baby Bargains book) indicate that Dutailier has been suffering lately in terms of quality and the price is definitely at least $200 more than what you would spend for a Best Chair with ottoman. Overall I am happy with our choices and feel that we got really great selections. Ok, it is incredibly late at night and I should be heading to sleep, so I will sign off for now. But there will soon be more to read on diapering, my job, my family, movies I love, etc. to come! And more on what is like for me being pregnant!